There is no doubt that your railing is one of the most visible features of a deck. A great railing can make your deck look real good, and has an impact on your comfort in your backyard. 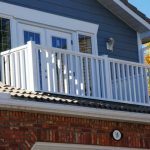 How can you be certain that your railing of choice is the best for your deck? Better yet, where do you start from when deciding on a railing to use? Before you even begin any process, you need to check with your local zoning office to familiarize yourself with any codes or regulations your project must adhere to. 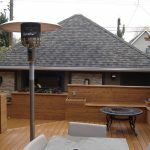 There are regulations as to the height of a railing (more on that in a bit), distance between decking and ground level, and even baluster spacing. Balusters in most environments, for instance, are to be no more than 4 inches apart to prevent children falling off or getting their heads stuck in. Railings are most notably a safety feature that combine to serve aesthetic purposes. But they are more than that. Under the building codes, a residential railing is to be no less than 36 inches, while commercial railings are billed for 42 inches. This allows you to see clearly over when seated. The use of tempered glass railing and black-finished round pickets are some great ideas to keep your line of sight open. If you want to maintain your privacy within your space, you would have to consider substituting a privacy screen for a railing. A privacy screen 5 feet high and above would help keep your deck happenings private from the line of sight of a neighbor. A well selected privacy screen combined with large, decorative toppers would give your deck a sharply attractive look. Your railings are important to the feel of your deck and the entire outdoor space. Be sure to select a railing that matches your desires, stays within acceptable building safety codes, and beautifies your landscape. 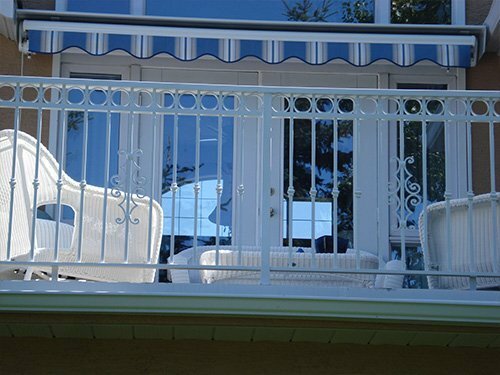 Mountain View Sun Decks Ltd. provides Calgary with beautiful & safe custom railing solutions. Whether you’re looking for aluminum railings, wooden railings, or more, contact us at Mountain View for any of your railing and decking needs.